The ViewSonic® VX2457-mhd is a 24” (23.6” viewable) Full HD monitor built for the ultimate gaming and entertainment experience. 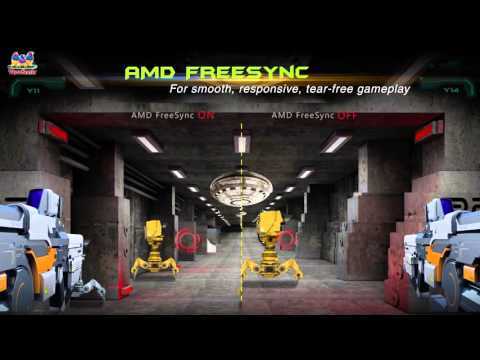 Equipped with AMD’s FreeSync™ Technology, the VX2457-mhd’s dynamic refresh rate virtually eliminates screen tearing in order to provide a fluid gameplay experience during fast paced action scenes. Complimenting FreeSync™ Technology, the monitors ultra-fast 1ms response time and fastest input response mode provides a smooth screen performance without blurring or ghosting for any multimedia applications. We didn’t just stop there, for the best gameplay experience we also integrated a gaming oriented hot key that features on the fly optimized presets for FPS, RTS and MOBA. The monitor also offers a black stabilization function that delivers richer color and better contrast for dark scenes in multimedia and gaming scenarios. The VX2457-mhd is equipped with a full array of advanced connectivity including DisplayPort, HDMI and also the legacy VGA option for flexible connection to PCs, laptops, gaming consoles and entertainment devices. The monitor has 80M:1 MEGA Dynamic Contrast Ratio for sharp and crisp color performance for enjoying any multimedia content. Lastly, to maximize user comfort and enhance viewing experience, the VX2457-mhd is packaged with Flicker-Free technology, Blue Light Filter and low EMI function.